Goibibo is the Fastest Growing & Most trusted online travel booking platform in India. They are offering Rs. 50 goCash for every friend who installs app and signs up with your referral code. Your friend gets Rs. 500.It means if you use below code you will get rs 500 to rs 500 bonus at first. You will also earn extra 10% earning of your friend's booking amount when they travel with Goibibo.With your Goibibo cash you can book bus ,flight or cab tickets and also book hotels also. As you enter above code you get Balance now use this balance book any thing from goibibo site. Click on upper left corner. There you will see an option of "Refer & Earn". Share that code with your friend and get Rs. 50 goCash per referral and enjoy free traveling. New Referral Programme is only valid on new installs and sign ups on mobile apps. 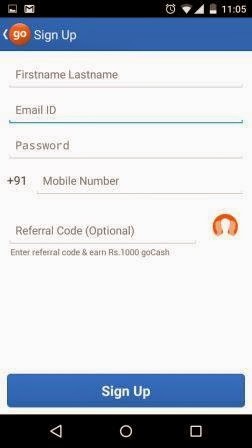 If you had referred your friend from web, he/she can join either on web using link shared in email or install mobile app and sign up on it using any referral code. If he/she uses someone else's referral code, that person will get benefits, even though you had referred him/her first. GoIbibo reserves all rights to change the amount conferred under the Referral Programme Scheme. 10% of your friend's booking amount will be credited only after user's travel date is past. If he cancels the ticket before that, you won't get referral goCash. 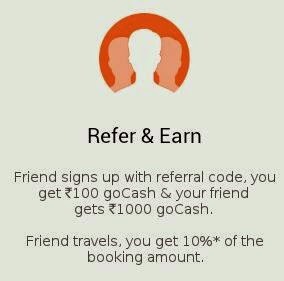 All goCash terms and conditions are applicable on goCash earned through referral programme. Goibibo has all rights to terminate any user's goCash account if any misuse is observed.